Witch Mountain, from Portland, Oregon, was originally a trio, making use of clean and punkish plus guest female vocals. Early work combined riffing, downtuned Doom with a number of influences including punk and "math" rock - lots of time and tempo changes. Following a split and reformation, their 2011 'South Of Salem' album represented a more polished sound, showcasing the exceptional voice of new full-time vocalist Uta Plotkin. 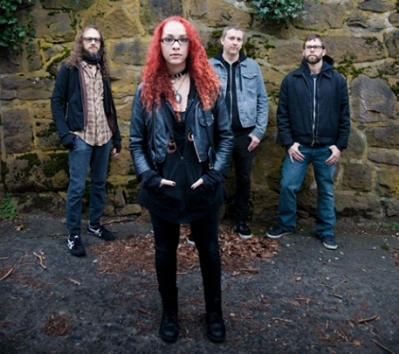 Plotkin was replaced by Kayla Dixon in 2015, along with new bassist Justin Brown, joining remaining founder members Nathan Carson (drums) and Rob Wrong (guitars/ex-vocals). Burn You Down (Single) 2016 Mountastic Records 12"
'Come the Mountain' also features the strong vocals of Lost Goat's Erica Stolz. The new edition of this album features extra tracks originally intended for a video game which was never released. Witch Mountain released this version on their own imprint, Mountastic.